EK-FC RTX 2080 +Ti Classic RGB - Nickel + Plexi is a high-performance full-cover water block for NVIDIA® GeForce RTX 2080 and RTX 2080 TI graphics cards, based on NVIDIA Touring™ architecture. The water block comes with a pre-installed 4-pin 12V RGB LED strip. EK-FC RTX 2080 +Ti Classic RGB - Nickel + Plexi is a high-performance full-cover water block for NVIDIA® GeForce RTX 2080 and RTX 2080 Ti graphics cards, that are based on NVIDIA Turing™ architecture. 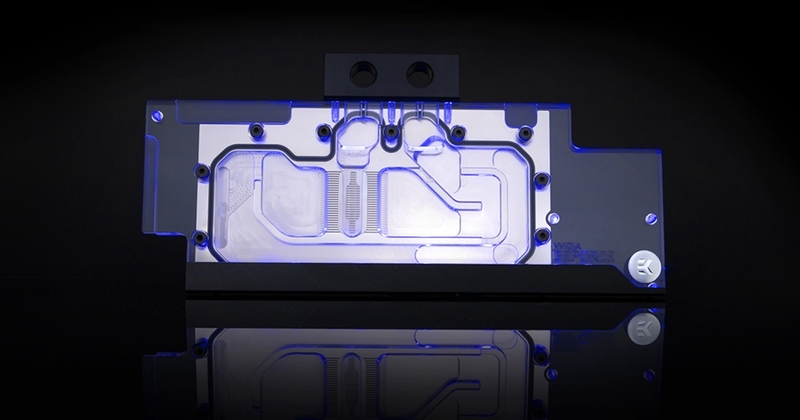 This water block comes with pre-installed 4-pin 12V RGB LED strip. This water block directly cools the GPU, RAM, and VRM (voltage regulation module) as water flows directly over these critical areas thus allowing the graphics card and it's VRM to remain stable under high overclocks. EK-FC RTX 2080 +Ti Classic RGB - Nickel + Plexi water block features a central inlet split-flow cooling engine design for best possible cooling performance, which also works flawlessly with reversed water flow without adversely affecting the cooling performance. This kind of efficient cooling will allow your high-end graphics card to reach higher boost clocks, thus providing more performance during gaming or other GPU intense tasks. Moreover, such design offers great hydraulic performance allowing this product to be used in liquid cooling systems using weaker water pumps. EKWB recommends the purchase of aesthetic retention backplate which improves the looks of your graphics cards and also provides some passive cooling to the circuit board VRM section. The EK-FC RTX 2080 +Ti Classic RGB - Nickel + Plexi water block is compatible with EK-FC RTX 2080 +Ti Backplate Classic - Black. NVIDIA® NV links are compatible with this water block. 3rd party NV Link support is not guaranteed.